This VIS image of the floor of Kaiser Crater contains a large variety of sand dune shapes and sizes. The "whiter" material is the hard crater floor surface. Kaiser Crater is located in the southern hemisphere in the Noachis region west of Hellas Planitia. Kaiser Crater is just one of several large craters with extensive dune fields on the crater floor. Other nearby dune filled craters are Proctor, Russell, and Rabe. Kaiser Crater is 207 km (129 miles) in diameter. 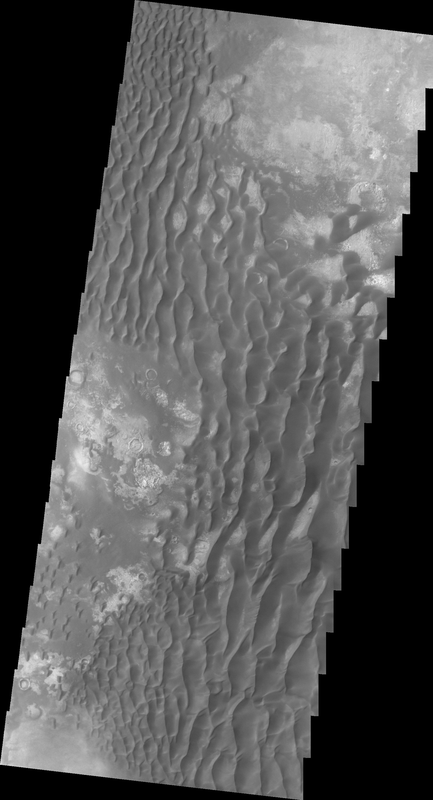 The dunes are located in the southern part of the crater floor.